Playing to nearly sold-out houses on June 3 and 4, 2010 at the Diana Wortham Theatre, BCA's student production of Giselle was undoubtedly a huge hit. From the wonderful peasant dances in Act I to the beautiful elegance of the second act Wilis, BCA's dancers -- including its corp of 26 pre-professionals -- brought the Diana Wortham Theatre to its feet. The production featured Cassie Woods as Giselle, Miles Sollars-White as Albrecht, and Sarah McGinnis as Myrthe, Queen of the Wilis. 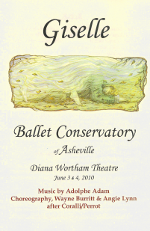 Download the Giselle 2010 program. Giselle, a weak-hearted young girl who is adored by her native villagers, lives with her watchful mother, Berthe, who warns her against excessive dancing. Hilarion, the village gamekeeper, is desperately in love with Giselle. Prince Albrecht, a nobleman who is already engaged to a noblewoman Bathilde, is captivated by Giselle's frail beauty and innocence. Albrecht disguises himself as a peasant named Loys and showers Giselle with affection. Hilarion is jealous and enraged when Giselle falls in love with Albrecht and believes that they are engaged. During the village’s grape harvest festivities Berthe has a vision that her daughter, Giselle, will one day become a Wili, a jilted maiden who dies before her wedding night. The Wilis emerge between midnight and dawn to vengefully trap any man who enters their domain, forcing him to dance to his death. Hilarion exposes Albrecht's disguise and his engagement to Bathilde. Overwhelmingly distraught, Giselle goes mad and dies of a broken heart. Hilarion is discovered just before midnight keeping vigil by Giselle's tomb. As midnight approaches, the Wilis appear with their leader, Queen Myrthe. This is the night Giselle is to be initiated as a Wili. Albrecht, laden with feelings of guilt and remorse, visits Giselle's grave, after a vision of Giselle leads him into the forest. At this point, Myrthe discovers Hilarion in the forest and orders the Wilis to dance around him until he dies from exhaustion. She then discovers Albrecht and demands the same fate for him as Hilarion, but Giselle’s bond of love is too strong. At dawn, as the Wilis retreat, losing their powers, Albrecht is saved by Giselle’s forgiveness, and she then rejoins the Wilis for the rest of time.